Outdoor music festivals are unique events given that they are, for the most part, bounded and ticketed, and alcohol is served. They frequently have a higher incidence of patient presentations when compared with similar types of mass gatherings. Often, however, single events are reported in the literature, making it difﬁcult to generalize the ﬁndings across multiple events and limiting the understanding of the ‘‘typical’’ patient presentations at these mass gatherings. 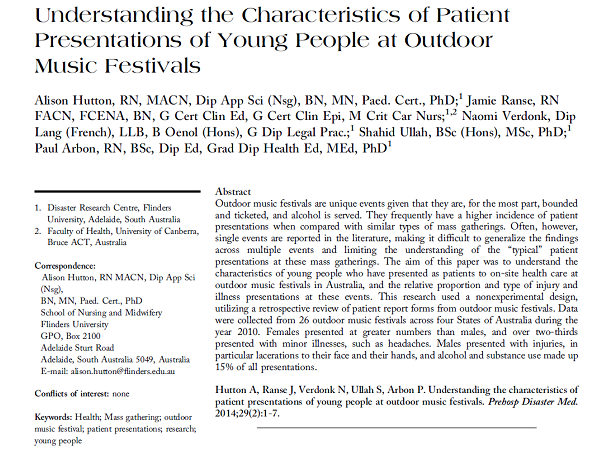 The aim of this paper was to understand the characteristics of young people who have presented as patients to on-site health care at outdoor music festivals in Australia, and the relative proportion and type of injury and illness presentations at these events. This research used a nonexperimental design, utilizing a retrospective review of patient report forms from outdoor music festivals. Data were collected from 26 outdoor music festivals across four States of Australia during the year 2010. Females presented at greater numbers than males, and over two-thirds presented with minor illnesses, such as headaches. Males presented with injuries, in particular lacerations to their face and their hands, and alcohol and substance use made up 15% of all presentations. Hutton A, Ranse J, Verdonk N, Ullah S, Arbon P. Understanding the characteristics of patient presentations of young people at outdoor music festivals. Prehospital Disaster Medicine. 2014;29(2):1-7. This is very interesting work. I look forward to seeing more of your work about health needs at music festivals.